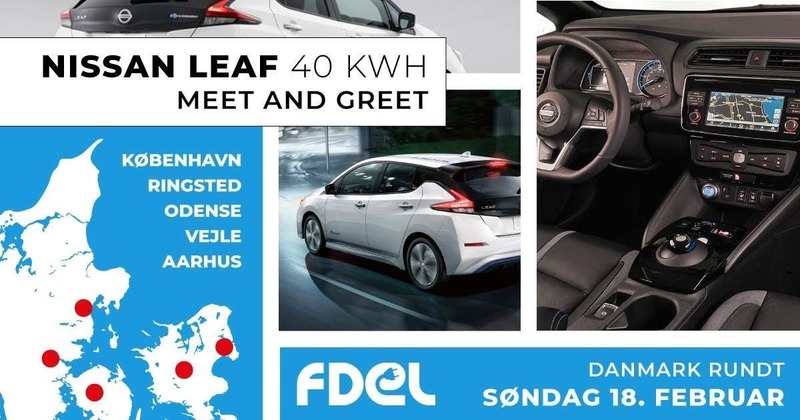 On this chilly Sunday, the Danish Association of EV owners, FDEL, had arranged a day trip through 5 major cities in the country with the new Nissan Leaf, giving the most curious of us a chance to see the car up close before official release. Now, that is actually a win-win deal. First and foremost for Martin and the other guys at the FDEL home base who get to drive the car for the first time, but also for the rest of us, because it is so important for customers to get an accurate assessment of what the car can actually do in localized conditions. This particular event was the end of 10 days and almost 2,500 km of test driving. The car was hooked up to a computer most of the time to evaluate drivetrain and battery performance. 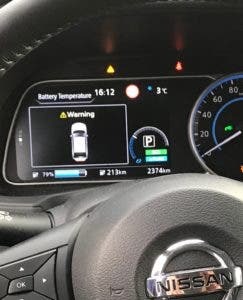 The question that we all ask is of course about range, and what Martin Messer Thomsen could inform at this time was that the car had 37 kWh of available battery capacity at full charge, giving it 160 km (99 miles) range at 110 km/h (68 mph) at an ambient temperature of 0°C. That’s 4.3 km/kWh which corresponds quite well to my own experience with 15,000 miles in the first generation Leaf. According to my own calculations that would give at least 225 km (140 mile) real-world highway range at 20°C. Not bad at all, and of course as the instruments indicated when I checked, the range estimate had gone up because the last few miles were driven in the city. Unfortunately it was not possible to get a test drive, due to the tight charge-drive schedule, but a couple of minutes in the driver’s seat proved quite comfortable. Having driven the first generation Leaf, I felt instantly at home. All buttons were in the same place, but the dashboard was very much improved, and featured clearer screens with better graphics all round. I had heard the exterior was more pleasant to the eye in real life, and I agree. I must admit that I was not sure I liked the design that much looking at pictures only, but when you walk around it, and step inside it, you kind of feel like yeah, I would actually like to own it. The new Nissan Leaf is expected to go on sale in March, but there is no word yet on availability. The price tag on the 40 kWh version is very competitive and I hope it will enjoy huge success on the Danish market, because this market really needs a new beginning.